The purpose of this document is to define a physical platform for mid-sized embedded Single Board Computer (SBC) with multiple I/O expansion options. Its size is midway between the industry standard PC/104 stackable format and EBX SBC format. This size board will support larger processors requiring large heat sinks. The added space also allows for combining features on an SBC which would normally be found on multiple PC/104 modules. A board that is a small, industrial-grade embedded SBC with the option of I/O expansion via PC/104, PC/104-Plus, PCI-104, PCIe/104, PCI/104-Express, USB, Ethernet, etc. A board that is a complementary form factor to EBX and PC/104. A board that will emphasize I/O connector area. Designers are always striving to add more functionality in less space. Advances in semiconductor density, packaging technology, and connector technology have made this possible. 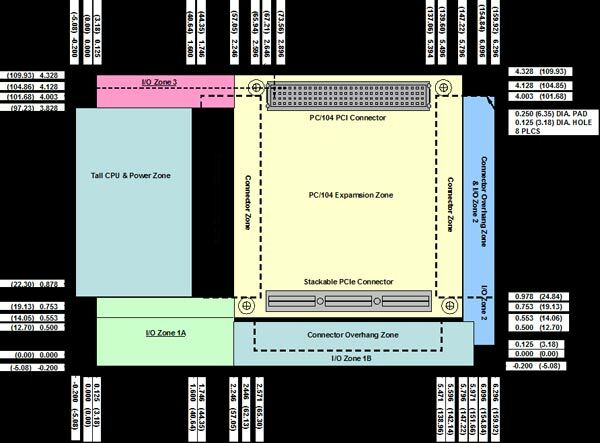 PC/104, PC/104-Plus, PCI-104, PCIe/104, and PCI/104-Express are recognized standards as well as EBX; however, there is no industry standard for a mid-size board. This specification defines a new standard, open-architecture, embedded SBC platform that is larger than a PC/104 stackable board yet smaller than an EBX SBC board.